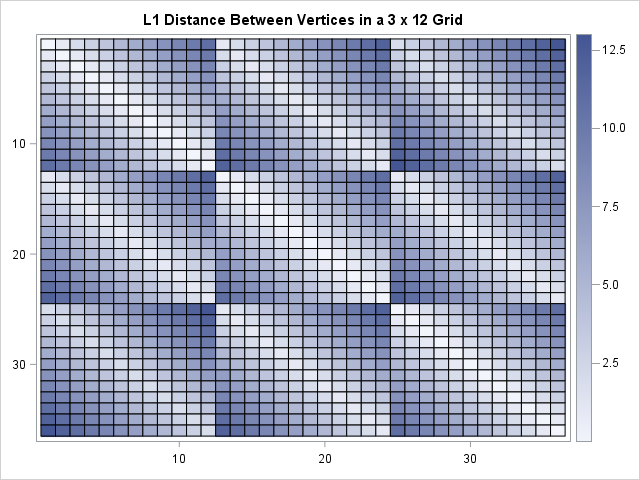 Given a rectangular grid with unit spacing, what is the expected distance between two random vertices, where distance is measured in the L1 metric? (Here "random" means "uniformly at random.") I recently needed this answer for some small grids, such as the one to the right, which is a 7 x 6 grid. The graph shows that the L1 distance between the points (2,6) and (5,2) is 7, the length of the shortest path that connects the two points. The L1 metric is sometimes called the "city block" or "taxicab" metric because it measures the distance along the grid instead of "as the bird flies," which is the Euclidean distance. The answer to the analogous question for the continuous case (a solid rectangle) is difficult to compute. The main result is that the expected distance is less than half of the diameter of the rectangle. In particular, among all rectangles of a given area, a square is the rectangle that minimizes the expected distance between random points. Although I don't know a formula for the expected distance on a discrete regular grid, the grids in my application were fairly small so this article shows how to compute all pairwise distances and explicitly find the average (expected) value. The DISTANCE function in SAS/IML makes the computation simple because it supports the L1 metric. It is also simple to perform computer experiments to show that among all grids that have N*M vertices, the grid that is closest to being square minimizes the expected L1 distance. 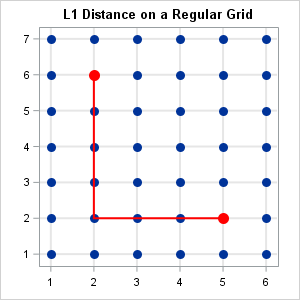 For an N x M grid, the L1 diameter of the grid is the L1 distance between opposite corners. That distance is always (N-1)+(M-1), which equates to 6 units for a 4 x 4 grid. As for the continuous case, the expected L1 distance is less than half the diameter. In this case, E(L1 distance) = 2.5. As indicated previously, the expected distance between two random vertices on a grid depends on the aspect ratio of the grid. A grid that is nearly square has a smaller expected distance than a short-and-wide grid that contains the same number of vertices. You can illustrate this fact by computing the distance matrices for grids that each contain 36 vertices. 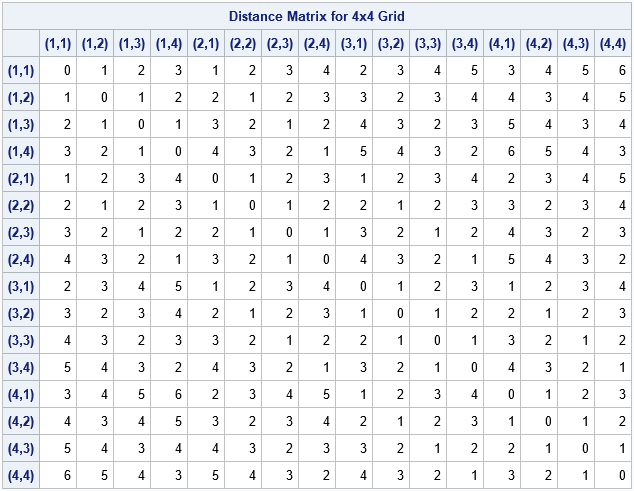 The following computation computes the distances for five grids: a 1 x 36 grid, a 2 x 18 grid, a 3 x 12 grid, a 4 x 9 grid, and a 6 x 6 grid. Each point on the graph represents the average distance for an N x M grid where NM = 5,040. The horizontal axis displays the value of N (rows). 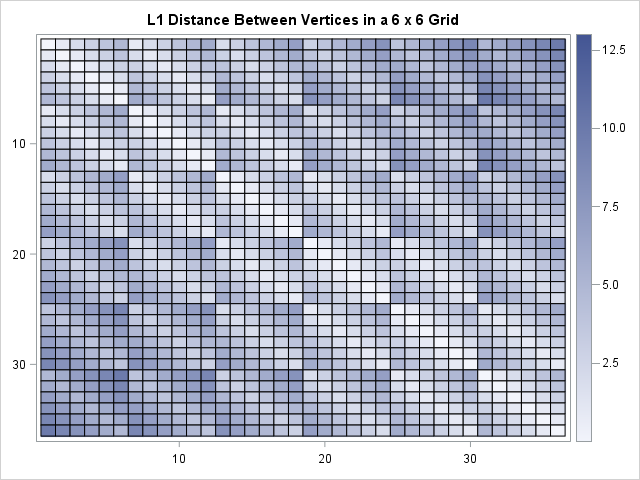 The graph shows that nearly square grids (rows greater than 60) have a much lower average distance than very short and wide grids (rows less than 10). 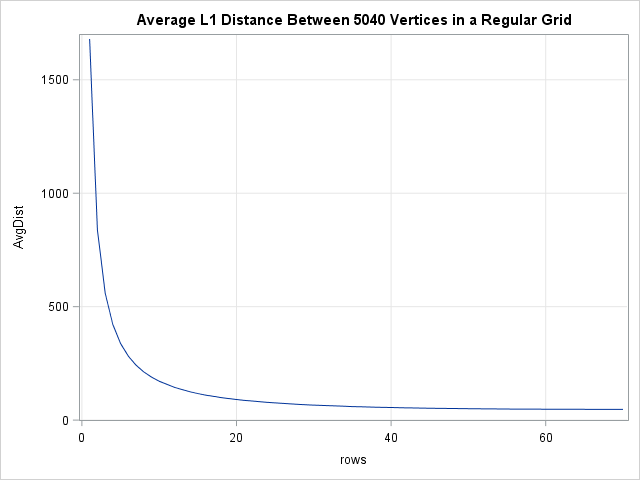 The scale of the graph makes it seem like there is very little difference between the average distance in a grid with 40 versus 70 rows, but that is somewhat of an illusion. A 40 x 126 grid (aspect ratio = 3.15) has an average distance of 55.3; a 70 x 72 grid (aspect ratio = 1.03) has an average distance of 47.3. 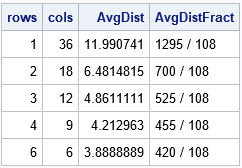 In summary, you can use the DISTANCE function in SAS/IML to explicitly compute the expected L1 distance (the "city block" distance) between random points on a regular grid. You can minimize the average pairwise distance by making the grid as square as possible. City planning provides a real-world application of the L1 distance. If you are tasked with designing a city with N buildings along a grid, then the average distance between buildings is smallest when the grid is square. Of course, in practice, some buildings have a higher probability of being visited than others (such as a school or a grocery). You should position those buildings in the center of town to shorten the average distance that people travel. The post Distances on rectangular grids appeared first on The DO Loop.